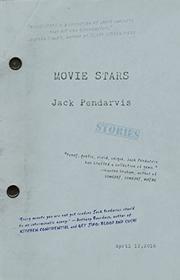 What’s also stellar is the manner in which Pendarvis, who has minted tales of the marginal, the weird, the hapless in such previous collections as Your Body is Changing (2007), somehow manages to be both caustic and compassionate in depicting his fumbling, comic characters. With most of these stories, he discloses how the movies, both in their myth and their melodrama, irradiate otherwise mundane or confused lives. In “Cancel My Reservation,” whose title is borrowed from a 1972 comedy that turned out to be Bob Hope’s last theatrical film, a small-town fellow who doesn’t seem to get out much decides he’s going to fly first class to Los Angeles to bid at an auction of Hope’s memorabilia. “They gave Chuck paddle 187, police code for murder,” the story relates in the sardonic tone that prevails over most of these tales. Chuck’s not exactly sure why he’s there beyond some impulse to snag an artifact for a friend who likes Hope. All one can safely say without spoiling things is that whenever you arrive in a strange place with no real direction, somebody will point you somewhere anyway, whether you like it or not. Similar unpleasant surprises happen to the sad-sack protagonist of “Jerry Lewis,” in which his search for a missing cat yields the realization that “he was happy being miserable. He was happy that living in Mississippi would give him a great excuse to be a failure.” Oh, and why is it called “Jerry Lewis?” Something to do with an open box of doughnuts, but that would be telling too much. And, as one might expect from such a collection, there’s a story called “Your Cat Can Be a Movie Star!,” in which another deluded dreamer seems to be one of those souls upon whom everything is lost. Such bleak hilarity may not be to everybody’s liking. But for those who have a taste for smoke-cured Southern droll, Pendarvis is among the more satisfying, laugh-out-loud absurdists a post-Millennial reader can ask for. There are ghosts, too. At least, they seem like ghosts. Maybe they’re just wacky neighbors.